Developers choose WordPress on a daily basis because of its extensibility, security, community, and more. Stop being frustrated with lackluster solutions. Try WordPress. It’s not new. In fact, during the last decade, WordPress has emerged as the most powerful Content Management System (CMS) for building websites and has surpassed the impression of being just another blogging tool. WordPress has not only become a major preference for web developers but is also becoming popular for mobile app development as well. Being free and open source is one of the biggest reasons why WordPress is the best choice for developers. Just install it and take full control of it. You can modify and edit its source code to build almost any type of website. This not only helps you save money for any proprietary CMS software but also brings added benefits to an open-source community as well. With the best intellectual property, the people in this community offer added benefits to the entire tech world. The open source community is highly motivated and collaborates, sharing their knowledge to innovate together. When compared to other Content Management Systems, WordPress seeks less setup, customization, and maintenance costs. Small sites use shared hosting which is Linux based so is cheaper to create and have a site running in a few minutes. WordPress can be easily set-up in 5 simple steps. With WordPress, you get not only a piece of free software but also a huge community which is there to extend support whenever needed. People are contributing their support and ideas generously making it better and better. Simultaneously, such a vibrant, open source community has helped several developers cut their support costs. To handle all types of queries, you find a plethora of active community support channels like StackExchange, Stack Overflow Facebook Groups, Twitter Groups, WordPress Forums, etc. Apart from these, there is also the official support forum, where you find WordPress professionals helping one another. In many areas of the tech industry, continuing education can be cost-prohibitive. WordPress offers many paths for self-education ranging from Meetups, WordCamps, community forums, to Youtube and freemium third-party tutorials. The internet is flooded with learning resources including articles, tutorials (free and paid) and, of course, WordPress.tv. WordPress also comes pre-installed with a lot of prominent hosting companies. WordPress has even helped several hosting companies grow their businesses with improved and innovative service solutions like managed hosting. Security is a primary concern for web developers, and WordPress offers a robust solutions in this regard. There are free and premium security services available. As a community, and a development platform, WordPress has it covered. The core team has set some of the best standards for security. One of these is the regular updates which protect you from security vulnerabilities. The default architecture of WordPress is such that it supports features like posts, pages, comments, media, and more. Likewise, people can also create multiple Custom Post Types (CPTs) and Taxonomies for specific needs. With thousands of themes in the WordPress.org Directory, there are standards for common design elements and flexibility options for different use cases. The Customizer API provides a framework for themes to allow users to visually adjust aspects of a theme, from colors and layouts to widgets, menus, and more. WordPress is the most SEO friendly CMS available today. Content is critical to website performance and WordPress incorporates both tools and code to allow frequent content updates. Numerous SEO solutions also provide tools that assist in site ranking. Not only are there robust and free SEO plugins, but WordPress provides technical SEO advantages. What makes WordPress so accessible and easy to learn is its extensive documentation which you can find on the web. Official documentation resources such as the Reference Handbooks for theme and plugin developers are quite handy. The Codex is also there to assist in understanding development with WordPress. Many other channels exist for documentation, as well. StackExchange is one such resource. Here you find answers and can post questions to any of your queries. Websites using WordPress are very responsive, as custom CSS can be added and be made friendly and responsive to any devices and screen sizes. WordPress offers a unique way of thanking and appreciating all those who contribute to making this open source script better and better. Developers can make contributions to the core software earning props and getting names displayed for contributing to new releases of the WordPress version. Likewise, there are profile badges for different WordPress volunteer channels which are displayed in their respective WordPress profiles. The WordPress community has grown into a fully matured enterprise sector, creating a huge job market which has helped numerous developers to put food on their table. While working as a freelancer is always an option, developers now have a choice of joining numerous WordPress agencies, as well. The platform itself is built in a way that it allows Google to effectively scan and index every content and ranking a WordPress site is much easier than other CMS platforms. Other than that you can always visit the job board to seek new opportunities in the WordPress ecosystem. 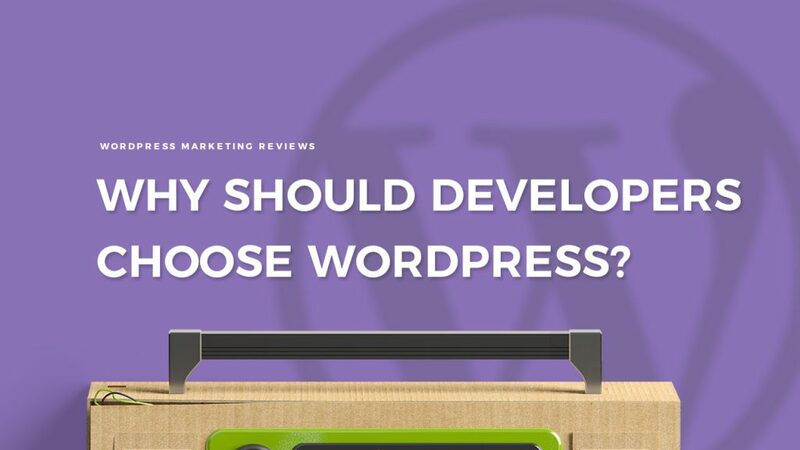 As a developer using WordPress, you have endless options to create a website. Whether it is for a blog, business, portfolio or a growing enterprise with hundreds of users and thousands of pages, WordPress answers the need. Leverage WordPress and its resources to complete your next project to ensure your success, and join the largest growing community on the internet. WordPress now powers over 30% of websites on the internet. If you haven’t begun developing with WordPress, you may be left behind. We’ll be looking forward to your thoughts in the comments below.